It is day three of the Live Below the Line Challenge, so the title of this post may have conjured up images of growing hunger pangs or the broadening gulf between between calories in and calories expended. But no, that is not the gap to which I am referring (though my stomach may beg to differ*). A recent article in the New York Times - yes, I've been quoting that liberal mainstream media a lot - got me thinking about the disparity in income and thus purchasing power between the rich and the poor. Specifically, it was about how the middle class in the United States can no longer claim to be the wealthiest of that tier in the world. It was the phrase, "the wealthiest Americans are outpacing many of their global peers", that struck the chord. What this says is look, on the scale of a country things might be looking up, but there is a large bit of the population that is not benefiting. 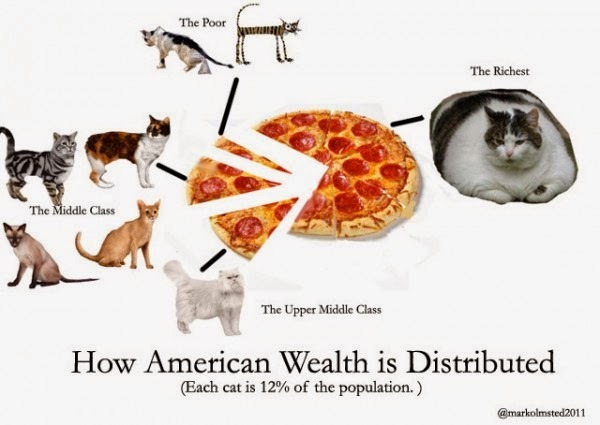 In activist speak, this would be the 1% figure cited by the Occupy Wall Street movement. In economist speak, the Gini Index describes how incomes diverge from a completely equitable distribution. The latter shows that countries with the greatest inequality are concentrated in Latin America and Sub-Saharan Africa, with sprinklings in East Asia (oh, yeah, and the US is on the high end...). While disparity between the haves and have-nots is often associated with distribution of power and political clout, it also has bearing (both directly and indirectly) on food security. Low income generally equates to less purchasing power, and where that decrease is taken in the context of large wealth differences, a dollar for people in poverty covers even less ground. According to the FAO, poor urban households spend 60-80% of their incomes on food (for context, the average American household spends a ridiculously low less than 10%). That means that relatively less can be spent on other needs - shelter, clothing, education, healthcare, etc. A growing income divide could also correspond to a "nutrition gap". While the wealthy can afford fresh produce and a greater diversity of food items, those on a budget face considerable restriction in what is actually accessible. This, unfortunately, is not restricted to domestic dynamics. Receiving considerable press (with some controversy over whether true) for the past few years, quinoa's recent rise to superfood fame has sparked some concerns for food security in one of Latin America's poorest countries: Bolivia. As consumers in wealthier nations drive demand for the Andean staple, prices have skyrocketed, quinoa farmers have earned more for their crop, and yet their traditional diet is now out of reach. Instead, Bolivians are turning to less-costly and process foods, such as white bread and rice. Graphics courtesy of Mother Jones and The Pragmatist.